Home » Explore More With a Motorized Cycle! When you are riding your bicycle in traffic, one of the biggest sources of anxiety is slowing down and then getting back to the speed again. It takes a lot of energy if you are new to cycling or weigh too much. The motor is great to help and it gets you from the speed ‘0’ to the traffic-speed rather quickly. It means that you don’t have to worry about people who are behind you. If you have tried riding uphill, then you might have felt the challenge or when you have to get down of the hill. With a motorized bike, the challenges are minimal and the hill will not be a problem at all. The motorized bikes have gained in popularity because of their hill climbing capabilities. When you have a motor, even the most intimidating hill will not be able to slow you down. The motor in the bike will be able to push you so that you don’t end up getting exhausted. Sometimes you feel so tired and you feel so drained that you don’t want to pedal anymore. With an e-bike, you can ride even when you are tired because of the thrust that is provided. 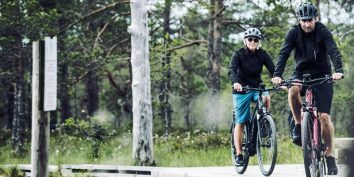 The motor assist is great as you are pedaling and are doing the physical activity, but you don’t have to put as much effort. So, when you are feeling tired or are just feeling lazy motorbike lets you put in more energy while traveling with the same level of efficiency. If you compare the price of a car to an e-bike, you will find the latter to be very cheap. You will have to pay for expensive fuels and also for regular maintenance. But, when you convert your normal bike into an e-bike with the help of a motorized one, you will have to pay the price of the bicycle motor kit only once. And the maintenance of an e-bike is not so expensive either. Unlike cars which create pollution, an e-bike is environment-friendly. You will not contribute towards the emission of greenhouse gases. When it is so simple to convert your regular bike into a motorized bike with bicycle motor kit, should you wait for exploring this world?